Americans have some of the best bug out location options in the world. When you factor in the ease of acquiring weapons and the ability to freely move from state to state, it gets even better. What is a Bug Out Location? People have many different ideas of what a bug out location should be. For some, it’s a relatives house that lives outside the city. 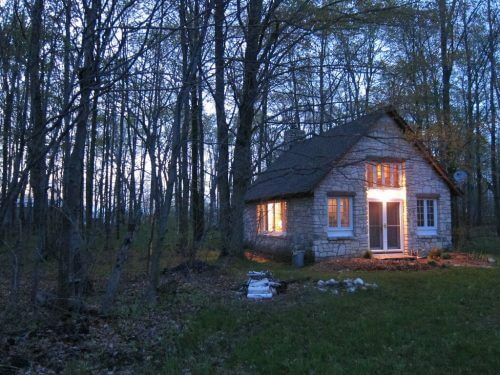 For others, it’s a fully loaded retreat in the woods with enough supplies to last 100 years. All bug out locations have something in common. They are a place that is located away from your home that you can go to in the event that your home becomes uninhabitable for some reason. We discuss some of the reasons to bug out at length in other articles. For our purposes here it can be anything. A natural disaster, a man-made disaster or anything else for that matter. What should you look for in a good bug out location? Ideally, you’re going to want to go somewhere with a low population, that can support you and your family. This means trees, wildlife, water, and shelter. The weather is important as well. Moderate weather throughout the year is excellent if you can find it. If an area typically has seasons with extreme weather like tornados, floods, or draughts, then you’re better off selecting somewhere else. Mild winters and summers are ideal. Long growing seasons and not having to contend with extreme temperatures are both a big plus. You should also be thinking about defensibility when you’re making your decision. This isn’t really related to the part of the country as much as it is the particular terrain in the area you want to bug out to. Does the area stand out on the landscape or is it hidden from view? Either way will work but if you can be seen from the road, you may have to deal with people looking for a place to stay or supplies. Make sure you have a plan if people are likely to see you from a distance and stop in unannounced. Is the area close enough to where you live in order for you to get there in the event of a disaster? When the time to bug out comes, you’re going to want to get to safety in a relatively short amount of time. Anything more than a couple hours is too much for me. You’re going to have to decide how long that time is for you and your family. Are there alternate ways for you to get there if the roads are jammed full of traffic? Are there train tracks that you could use to access the area? Are there powerlines nearby that may have a right of way cleared under them? Thinking outside the box is key when you’re in a disaster situation. Look up maps of the area online and make note of any natural or man-made routes you could use for travel. Do you need a vehicle to get there? What happens if your vehicle breaks down or can’t be used for one reason or another? If you’re a three-hour drive away what happens if you need to walk that distance? These are all things that we need to plan for ahead of time. Having a solid bug out bag is going to be key if you need to take the family on a multi-day march! 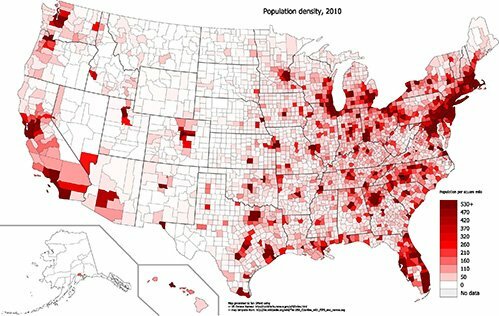 We want to stay away from large population centers so that rules out a lot of the northeastern coastline, most of Florida and a lot of California. It also rules out any major city like Chicago, Atlanta and the Dallas-Fort Worth area. 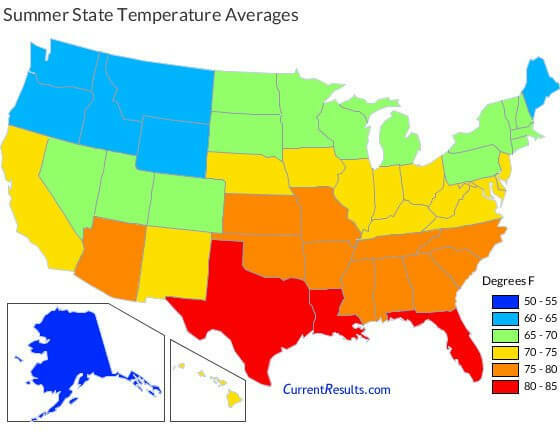 Looking at this map we can see the average summer temperatures for each state. If we want to stay out of the hottest areas of the U.S. we’re going to have to avoid Florida, Lousiana, and Texas. Other areas to avoid area the southwestern U.S. which has vast amounts of desert and little water. The pacific northwest which typically has decent amounts of vegetation, animals and natural water supplies. The Appalachian mountains are another area that would be good. Much of the central plains states are also a good choice. Arkansas, Mississippi, Alabama and southern Georgia would also be high on my list. Keep in mind this is just a rough look at the country as a whole. For the most part, you’ll be able to find a good place to call your bug out location in any area. Certain locations have other things to consider as well. For example, if you’re bugging out to the central U.S. you may need to be aware of tornadoes and other extreme weather. If you live in Utah, prepping is practically a way of life due to the influence of the LDS church. Every place has positive things about it that could easily outweigh the things that we’ve discussed above. This was just a brief overview of some of the things you should consider when you’re trying to find a bug out location. Any number of things could make a certain area perfect for you or make an otherwise great place not work. It all comes down to the needs of you and your family! Be sure to check out our other preparedness articles before you go.